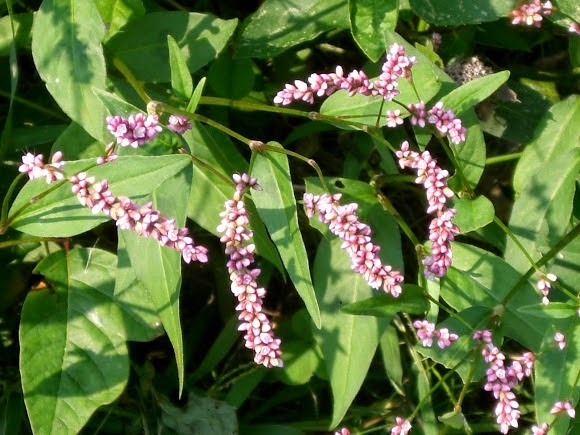 Smartweed (Arsesmart) is known as Polygonum Hydropiper, Water Pepper, La Liao, Biting Persicaria, Persicaria Acre, Piment Aquatique, Bity Tongue, Arcmart, Pepper Plant, Smartass, Ciderage, Red Knees, Culrage, Bloodwort. Smartweed has long been known for its hot, biting, peppery flavor, and has been used as a seasoning for thousands of years. A native plant of both Eurasia and America, smartweed grows where the soil is damp, along streambanks, and in wet ditches mostly in central and northeastern states. The branched stem, 2 to 3 feet in length, creeps at first, then becomes semi-erect. The leaves are lanceshaped, shortly stalked, wavy, more or less acute, glandular below, fringed with hairs. The stipules form a short inflated ochrea. The greenish-pink flowers are in long, slender, loose racemes, that mostly droop at their tips. There are six to eight stamens, two of which are functionless; two to three styles to the pistil. The fruit is black and dotted, as long as the perianth, three-sided and nut-like. The leaves have a pungent, acrid, bitter taste (something like peppermint), which resides in the glandulat dots on its surface, no odour. Smartweed possesses powerful nutritional properties that have been traditionally used for respiratory support, to relieve bloating, and for gastrointestinal distress. The recognized benefits of smartweed are not exclusive to herbal or traditional therapies, either. Recent studies have confirmed the numerous positives that natural healers have known about for years. Smartweed has a long history of herbal use, both in Eastern and Western herbalism. In combination with tonics and gum myrrh, Smartweed is said to have cured epilepsy - probably dependent on some uterine derangement. The infusion in cold water, which may be readily prepared from the fluid extract, has been found serviceable in gravel, dysentery, gout, sore mouths, colds and coughs, and mixed with wheat bran, in bowel complaints. Antiseptic and desiccant virtues are also claimed for it. The fresh leaves, bruised with those of the Mayweed (Anthemis Cotula), and moistened with a few drops of oil of turpentine, make a speedy vesicant. Smartweed is simmered in water and vinegar, it has proved useful in gangrenous, or mortified conditions. The extract, in the form of infusion or fomentation, has been beneficially applied in chronic ulcers and haemorrhoidal tumours, also as a wash in chronic erysipetalous inflammations, and as a fomentation in flatulent colic. A hot decoction made from smartweed has been used in America as a remedy for cholera, a sheet being soaked in it and wrapped round the patient immediately the symptoms start. In Mexico, the infusion is used not only as a diuretic, but also put into the bath of sufferers from rheumatism. 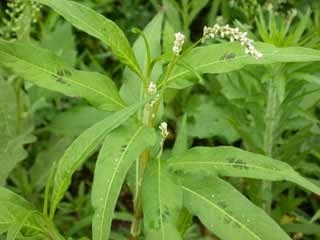 A fomentation of the martweed leaves is beneficial for chronic ulcers and haemorrhoids - in tympanitis and flatulent colic, and as a wash in chronic inflammatory erysipelas. Research indicates that smartweed extracts have hemostatic properties, and that they lower the blood pressure. Studies on animals have also shown that the plant does indeed have contraceptive effects, as people have claimed. Smartweed was once held that a few drops of the juice put into the ear would destroy the worms that it was believed caused earache. There is a tradition, quoted in old Herbals, that if a handful of smartweed be placed under the saddle, a horse is enabled to travel for some time without becoming hungry or thirsty, the Scythians having used this herb (under the name of Hippice) for that purpose. A water distilled from smartweed, taken in the quantity of a pint or more in a day, has been found serviceable in gravel and stone. Smartweed is astringent, diaphoretic, and diuretic. It is effective as an extract against coughs and colds, and crushing the fresh herb, and using it as a plaster for congestion is common practice. Some people claim that the crushed herb relieves many different kinds of pain. The expressed juice of the freshly gathered plant has been found very useful in jaundice and the beginning of dropsies, the dose being from 1 to 3 tablespoonfuls. Leaves and stems - raw or cooked. They can also be made into an acid peppery condiment. They are very hot. The leaves contain about 7.5% protein, 1.9% fat, 8% carbohydrate, 2% ash. The leaves are said to contain rutin. Seed - raw or cooked. It is rather small and fiddly to utilize. The seed is used as a condiment - a pepper substitute. The sprouted seeds or young seedlings can be used as a garnish or added to salads, they are commonly sold in Japanese markets. They are very hot. Pregnancy and breast-feeding: Not enough is known about the use of smartweed during pregnancy and breast-feeding.